The move of Metropolitan Onufriy was adopted unanimously. 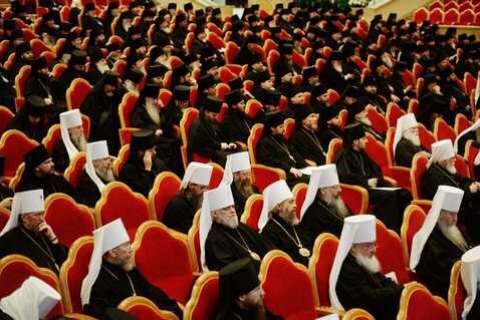 The Bishops' Council in Moscow highlighted in the charter of the Russian Orthodox Church (ROC) that the UOC of the Moscow Patriarchate is based in Kyiv, RIA Novosti reported on Thursday, 30 November 2017. Earlier, the UOC Metropolitan of Kyiv and All Ukraine Onufriy asked the Council of Bishops to emphasize the special status of the Ukrainian Orthodox Church of the Moscow Patriarchate in the ROC charter. The minutes of the meeting of the Council of Bishops read that "the proposal of His Beatitude [metropolitan Onufriy] was adopted unanimously." The current ROC charter mention the status of the Ukrainian Orthodox Church among other "Self-governing Churches". Metropolitan Onufriy said that the wording "does not fully reflect the definition of the 1990 Bishops' Council of the ROC on granting the Ukrainian Orthodox Church independence and self-administration." In this connection, Onufriy, in particular, proposed the creation of a dedicated chapter of the ROC's charter, entitled "The Ukrainian Orthodox Church." It is worth noting that a bill on religious organizations governed from the aggressor state, Russia, is awaiting revision in the Verkhovna Rada. The bill provides for the re-registration of charters of all religious communities in the country and conclusion of agreements with the state. In the agreements, churches must recognize the territorial integrity of Ukraine and pledge that they will not to be involved into anti-Ukrainian activities. The bill also provides that the UOC-MP must receive the prior approval of the state on the appointment of leaders of central and regional church structures.